Breaking: Liverpool officially signed Xherdan Shaqiri. 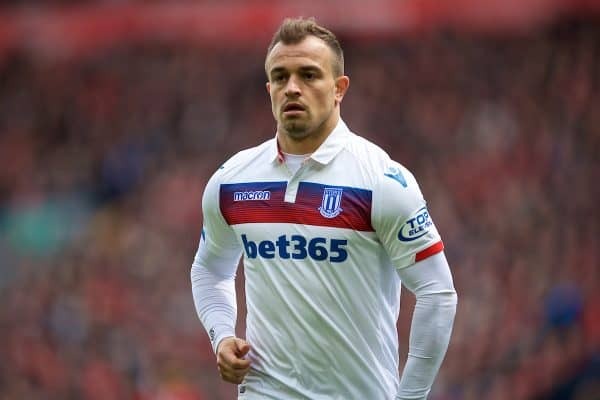 Liverpool are one step away from completing their move for Stoke City’s winger and striker Shaqiri. The Reds reached an agreement with the Britannia Stadium outfits for the services of the Switzerland international. He has played 84 matches for Stoke city but his goals weren’t enough to help the team avoid relegation at the closing stages of last season. Considering his experience and class, the Championship League seem to be a sub-standard League, therefore, he is desperate to join another club – probably Liverpool – before the start of the coming season. However, the Reds are hoping to let go of Sheyi Ojo on a loan deal to Stoke City as a means to convince the relegated team to let go of their Switzerland, according to the Sun. The striker was in action for Switzerland at the ongoing summer FIFA World Cup in Russia but he wasn’t lively as expected before the start of the tournament. In other Liverpool news, the Reds are currently having transfer talks with Lyon over the possibility of signing Frenchman Nabil Fekir this summer. Manchester City manager Pep Guardiola is certain that his Manchester United counterpart Ole Gunnar Solskjaer is the right man for the Red Devils job. Guardiola talked about Solskjaer who’s under pressure following the Red Devils’ poor run of form in recent weeks ahead of his first league meeting with him. During his pre-match press conference before the Manchester Derby clash at Old Trafford, Guardiola told reporters that being a manager can be a lonely road before adding that Solskjaer will lead Manchester United out of their present state. Solskjaer and Manchester United have not had the best of months following a run of six defeats in eight games including the 4-0 thumping at the hands of Everton at the weekend. Everton thrashed Manchester United 4-0 in their Premier League meeting on Sunday afternoon to dent their hopes of making the Champions League next season. Manchester United will have to finish the season in the first four places on the league table to qualify for the Champions League next season. The Red Devils trail the top four places by three points ahead of their league meeting with champions Manchester City who are bidding to retain their title. Manchester City have to win the game to secure top spot ahead of Liverpool.